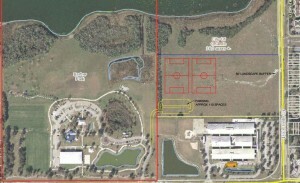 Rendering of additional soccer fields Orange County government will construct now that Mayor Dyer and the City of Orlando have turned over the land for park use. It took nearly two years, but Buddy Dyer has finally come through on his word and community residents will finally get additional soccer fields and an expanded Barber Park. Dyer put the item on the consent agenda today for the first time since he verbally committed back in 2013. For months, I have pushed the Dyer administration for answers about what was delaying the verbal land deal he made with Orange County Commissioner Pete Clarke to create new youth soccer fields for so long. Residents were also demanding answers, as Barber Park at Lake George is one of the more popular and overcrowded parks for local families. Part of the City of Orlando’s 36 acre portion of the land is contaminated with arsenic after Dyer failed for years to clean up the area. Orange County has always wanted about 15 acres, where the land is not contaminated, to develop new youth soccer fields. In 2013, Commissioner Clarke and the Orange County government believed the land would be annexed to allow County impact fees to be used. However, with today’s vote Orange County is granted a recreational easement providing the right to construct, repair and maintain recreational and related facilities including soccer and multipurpose recreational fields along with parking and other associated facilities. To prevent residents, families and children from entering the contaminated portion of the city-owned land, Orange County will be allowed to install fencing to separate the recreational area from the remaining portion of the property, according to the City’s agreement. Showing some of Dyer’s true political colors, Mayor Dyer inserted language in the agreement to require all signage within the new recreational area to state that it is a combined City/County Park. Apparently, Dyer wants his credit after holding the deal up for years. Residents may remember how Buddy Dyer promised five years ago to clean the arsenic from this same area. After a development plan Dyer supported calling for townhomes on the land failed because of community opposition, Dyer promised the community the arsenic would be removed within two years. That never happened. No word if Dyer wants a sign with his name on it next to the arsenic contaminated land to take credit for that as well. Today’s vote is a long overdue step in the process. After months of excuses from Dyer’s administration, the impact hurting local children and families became clear during the last soccer season. “Every day during normal seasons, we have to turn away kids because we don’t have the capacity to create additional teams,” Kathy McCoy, volunteer for the South Orlando Soccer Club, told WFTV’s Lori Brown in April. Hopefully today’s vote will finally mean local families and children can benefit and enjoy an expanded Barber Park thanks to the millions of dollars the Orange County government has been waiting to invest. This is the investment residents and families deserve and it’s about time this deal got done!